The mission of Emerald Seed Company is to supply our customers with a consistent source of high quality vegetable seeds. We offer seeds of proven open pollinated and hybrid varieties, both proprietary and public selections. Emerald Seed Company has extensive experience and expertise in seed production and varietal development. We are especially qualified to meet your company's special needs as you provide your customers with an excellent selection of proven planting seeds. All Emerald Seeds are of the highest quality and have passed a very rigorous series of quality evaluations to insure that all seeds exceed importers' standards. Emerald Seed Company is strictly a wholesale vegetable seed breeder and producer. We partner with a network of seed distributors throughout the world to serve professional vegetable growers. For information on how to contact an Emerald Seed distributor nearest to you, please e-mail us. We may have distributorships available in your marketing area and we welcome your inquiries regarding our vegetable seeds. Please contact us for additional information on our product line and other details. 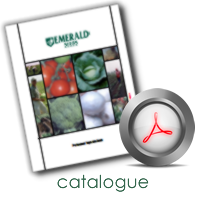 Current wholesale price lists are available to Emerald Seed distributors and seed dealers by either e-mail or fax. Please e-mail your request for our most recent price list. @aaronpopejoy I am an occasional user. Copyright © 2019 Emerald Seed. All Rights Reserved.